The Chief Executive Officer of Hutchison Telecommunication Nadarasa Thirukumal handing over the sponsorship cheque to the Chairman of the Organising Committee and Commandant of Sri Lanka Military Academy Brigadier S.K. Eshwaran at the media briefing held at Hilton Hotel. Commanding Officer of Sri Lanka Military Academy Colonel Shantha Ranaweera is also present. 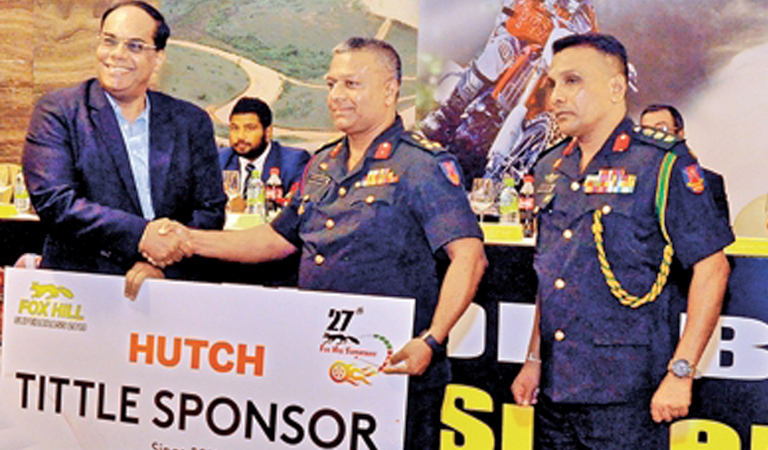 The 27th edition of ‘Fox Hill Super Cross’ organized by Sri Lanka Military Academy in association with Sri Lanka Automobile Sports will be flagged off at the picturesque circuit at Sri Lanka Military Academy Complex, Diyatalawa on April 21, from 8.30 a.m.
Over 350 drivers and riders vie for the championship at this iconic event this year. The event will comprises 12 motor car and 12 motorcycle events, including the championship races which will be taken into account in awarding the championship trophies to the country’s best driver and rider at the end of 2019 racing season. The championship races are grouped as Group SL-GT up to 3500cc and Group SL-H up to 1600cc in the motor car category and Group MX-Racing Motocross bikes upto 125cc (2 stroke), upto 250cc (4 stroke) and Group MX-Racing Motocross upto 85cc (under 16) in the motorcycle category. Truck and jeep diesel up to 5500cc and Super Motard open including 250cc upto 1100cc (2 stroke and 4 stroke) and cars upto 1500cc in the special motor car category are among the other popular races that are expected to add to the thrills and excitement of the competition. The inaugural Fox Hill races were held on October 3, 1993. The event is being organised by the Sri Lanka Military Academy annually to raise funds to maintain the infrastructure and training facilities of the institute with the expectation of being on par with other Military Academies in the region. The chairman of the Organising Committee Brigadier S.K. Eshwaran is grateful for the valued sponsors who have joined hands with Sri Lanka Military Academy for the event. Hutch Sri Lanka will be the main sponsor and there are many more co-sponsors who have come forward to make the event a success. It will be a great day for Drivers, Riders and as well as the motor racing fans who are eagerly waiting to witness the grand Super Cross that heralds the beginning of motor racing for the Year 2019.